Thankfully, I went to one of the better Shaws grocery stores the other day. As I strolled through the freezer aisle, I decided it was time to just give in and try Blueberry Cobbler. Sure I have two other SR flavors in the deep freezer waiting for testing, but I've been wanting to try this flavor. I guess I'm just a sucker for anything in with pie crust bits in it. 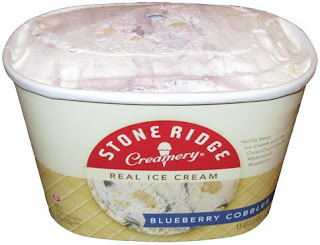 Stone Ridge Creamy Real Ice Cream - Blueberry Cobbler - Vanilla Bean Ice Cream with Pie Crust Crumbles and Ribbons of Blueberry. To be honest, I don't think this picture does the ice cream justice. Here, let's take a closer look. Ahhh, now that's a ribbon! Those are serious streaks of blueberry. Companies get a little too ambitious with their terminology like ribbons or loaded, but here we see the blueberry is coursing through the ice cream. Some vains are thick (dark purple) while others are thinner (light purple). Also, notice the vanilla bean flecks. The container says vanilla bean, not vanilla, and they mean it! Ok, so it looks good enough, and I couldn't wait to try it. I tried not to set my expectations too high because I feared for the quality of the blueberry. Well, it ain't bad, it ain't bad at all. I'm not a huge blueberry fan, so it's hard to impress me unless it's top notch, but it's pleasant enough. I guess the blueberry flavor is something similar to what you might find in those store bought blueberry mini muffins. Not super strong, but definitely blueberry. Basically, It's your typical flavor+vanilla mix, maybe a bit more potent than mild vanilla, but still a decent ratio. There's also no denying that blueberry aftertaste, though I'd prefer more of a pie crust aftertaste. Speaking of pie crust, the pie bits are decent. I'd say you get one in every other bite. They vary in size between fairly small to a decent size, basically it's luck of the draw (or will of the blender, depending on how you want to look at it). They have a nice texture, neither soggy nor crunchy, just crisp. Sure I'd like 2 or 3 in every big bite, but this is a budget ice cream, so we'll take what we can get. 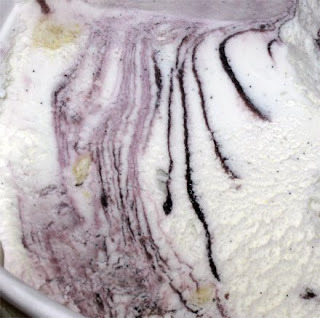 The ice cream is typical respectable Stone Ridge creamery quality and texture. It's not real dense or super creamy, but it's a nice middle ground and there's no chewiness! Thank goodness for that. You know, the more SR flavors I try, the more I appreciate this budget ice cream that refuses to admit it's a budget ice cream. Sure, we don't get a ton of pie bits, and it's not the best blueberry flavor ever, but it's trying, and any blueberry lover should give it a shot. Future Thoughts: I'd love to see this flavor with Raspberry and maybe a few more pie bits. Mmmm, make it limited edition if you want, but I just can't help but think of what could be!